Over the years our job as travel writers has taken us to some very fine hotels and restaurants around the world. While the food we have eaten has usually been excellent, and sometimes outstanding, the standard of service has often been disappointing and lack lustre. But now we can announce that at last we have found the epitome of what a waitress should be. She is French, her name is Sabrina, and she comes from Cannes. We had checked into the Hotel du Vin in Brighton, which is part of a small collection of stylish yet unpretentious properties that are dotted throughout England and Scotland. The group’s aim is to offer a relaxed and rather quirky atmosphere with locations as varied as a townhouse, brewery, warehouse and converted hospital. But they all come with that important and vital ingredient, namely a French-style bistro. From our home in Northumberland we had travelled south to help celebrate the sixtieth birthday of Roger, my wife’s brother in law. He had chosen, we think unbeknown to him, the busiest weekend in the whole year, for it was Gay Pride time, when gay couples come together from all over Europe to take part in an extravagant town parade and generally whoop it up! Brighton, well known for its gay community, welcomes it all with open arms. This huge influx of people meant that it was impossible to find accommodation on the Friday and Saturday, although thanks to mother and her friend Ian, who lives in Temple Street and runs his own small bed and breakfast establishment, we had a comfortable bed to sleep in until Sunday when we de-camped to the Hotel du Vin, which brings us back to Sabrina. She was part of a very high quality team of waitresses and waiters that the hotel had obviously selected with some care and attention. Many of them, not surprisingly, were French. And what really struck us was their obvious enjoyment at working around tables full of hungry and often demanding customers. Sabrina, with a lovely smile and sparkling eyes, moved among us with infectious enthusiasm. She had her hair tied back in a bun, and wore a crisp white shirt and tie, smart black trousers and a long apron. And as she brought our different courses to the table she served them with the greatest of care. Even when she was clearing a table, her dinner guests having left, she was eagerly looking to the other tables to make sure she was not needed, while her trips backwards and forwards to the kitchen seemed to be done walking on air. It was a joy to see. Such devotion to her job reminded us of the very best Italian waiters that pride themselves on their skills and abilities to wait at table, taught by such notable restaurant managers as Giuliano Piscina at the famous Hotel Splendido in Portofino on the Italian Riviera - one of our favourite places to dine. So why can the Hotel du Vin manage to get right such a vital aspect of running a restaurant when so many other erstwhile establishments fail? The answer seems to lie with Lora Strizic, the General Manager. She personally oversees the appointment of every waiter or waitress and makes sure that they fit in with the hotel’s aims and style. “It is so important that the staff are of the right calibre and are able to connect to our customers,” she told us as we toured the hotel together. It quickly became obvious that she is a stickler for detail, for the slightest thing out of place would be pounced on, while back at reception she was frequently there to deal with customers as they arrived or left. She too oozed a feeling of enjoying every moment of her work and that nothing was too much trouble. To go with the first class service we had a most enjoyable dinner. Some of our family had come down to join us making a table of six and we all tucked into the most delicious food. Many of the ingredients are found locally, including lamb from a farm in Sussex and some excellent beef. Their specialist supplier also finds other ingredients such as eggs, ducks and chickens from small producers. On offer were dishes such as salad of crayfish tail, plaice goujons, chicken liver and foie gras parfait with onion marmalade, roast corn-fed chicken breast, seared organic salmon, char-grilled, dry aged rib-eye steak, pan-fried calves liver and roast pork belly. For desserts we chose lemon posset, chocolate mousse with strawberry sorbet, crème brulee and strawberry and elderflower jelly with cherry sauce. The hotel, once the site of an old inn, is situated in the Lanes conservation area close to the famous Brighton sea front. The thirty seven bedrooms reach out into a higgledy-piggledy collection of rather eccentric, gothic revival and mock Tudor buildings and as you come in, heading for the wine bar, the hallway sweeps up to double height with exposed timber beams in the ceiling and an oak, carved staircase. 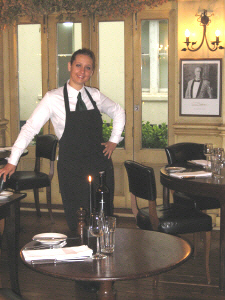 Then, as you step into the bistro, look out for Sabrina – she will not be difficult to spot! 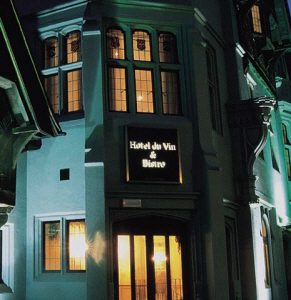 Hotel du Vin, Brighton, Ship Street, Brighton, Sussex BN1 1AD. Telephone: 0044 (0) 1273 718588. For bed and breakfast accommodation, contact Ian Burridge, 12 Temple Street, Brighton, Sussex. Husband and wife, Keith Allan and Lynne Gray are travel writers and photographers based in Berwick upon Tweed on the English/Scottish border. They have worked for The Times, Daily Telegraph, Financial Times, House and Garden, Scotland on Sunday and The Herald. For more than twenty years they have worked as freelance producers and reporters for BBC Radio, working from their own independent studio for BBC Radio 4, Radio 5 and Radio Scotland as well as the BBC's World Service.